Although we weren't making movies for public display, we ended up Spending 3 days here, taking in most of the property. Our first stop upon arrival on Thursday was Cedric's, a local draft house in the Village reeking of old world charm, great food and a pretty extensive draft menu. Making the most of the evening, we found ourselves settling here for the evening to imbibe and sample the local specials menu, including ---------- for me and fish and chips for my friends. Tomorrow is a new day so time to hit the hay. Friday night fun night is finally here and that meant we were going big. Not that kind of fun (wink wink) but a good time nonetheless. Time to tour the Biltmore! In order to prepare for this journey, we had to stop by The Stable House restaurant for some Appalachian fare and some pre game, including some local favorite grog, Pernicious IPA. Once inside the hotel, I mean house, It seemed like we were walking forever, witnessing extravagant Christmas decorations and trees in every room. After room. After room. Very French, elegant and monstrous. Ok, honey, is that enough Asheville ambiance? Alrighty, then...let’s talk weekend water! 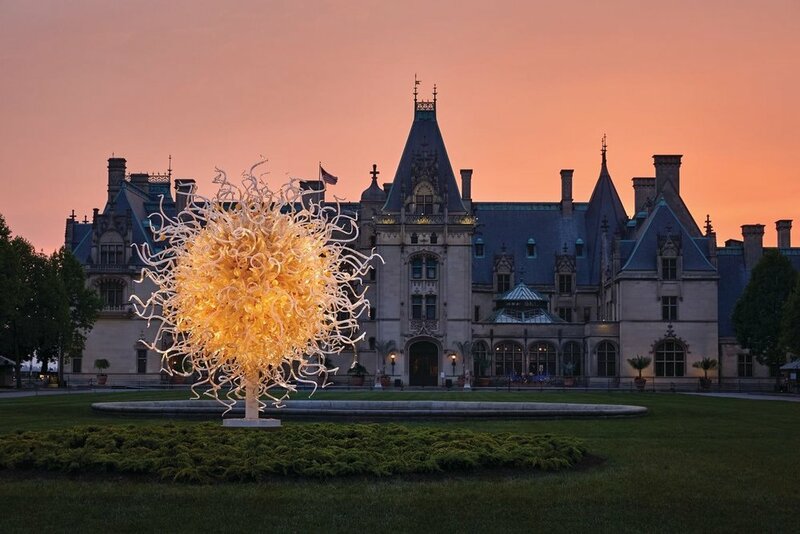 Touring the town of Asheville was our Friday afternoon adventure and it wasn't as dour as I would have believed it to be. Although Father Time had passed most of this town by (I swear I saw no less than 30 people wearing Wallabys, 5 dudes wearing puka shells and a Barney Fife looking cat who welcomed me as he passed), the last 10 years has seen a resurgence in the arts, including music, dance, painting, and, thank the Lord, the darkest art of them all, brewing. Having input on what to do from friends, we were instructed to go to Woolworths for lunch (no S)...huh? Who the hell is recommending that? Calvin Coolidge?!? Anyway, since I am always the one to strives to make everyone happy (see first sentence), we went. Sure enough, the old retail site was actually converted into a mini mall where artsy booths were set up in flea market fashion, further promoting the art community which has embedded itself in every fiber of this community. Ordering off a chalkboard, I Had the best chicken salad in quite a while from this soda fountain set up and think I paid $4? As a sidebar, I Also bought a pair of gray bucks at a mom and pop shoe store but that's another story. Hearing about the affinity for producing great beverages from this part of the state, we decided to try our luck at the most well known ale house of them all, Wicked Weed Brewing Co. In 2009, Walt and Luke Dickinson sat at a craft beer bar and talked about the dream of opening their own brewery focusing on big, West Coast hoppy ales and authentic Belgian ales brewed to inspire those who drank them. In 2017, Wicked Weed Brewing entered into a partnership with the Anheuser-Busch family of craft breweries. Wicked Weed’s original founders enjoy the same independent freedom and control over their recipes and brand development they’ve had since being founded in 2012. Have they sold out? Let's have a taste! Stopping in on a very cold day where it had just started to snow, the smell of a light mash warmed up our nostrils and, eventually, our minds. The place was a pretty modern, all wood interior with a patio area out front. With plenty of seating, this afternoon sported a lightly populated crowd, allowing Scotty and me quick access to the taps. Feeling like we were in an episode of Cheers, we were greeted by the tattooed tender who asked what we wanted. World peace came out of my mouth and instantly regretted it. Scanning the brew board hanging from the ceiling, I embraced every offering but could only drink one at a time. I selected Milk and Cookies Stout, a cold weather classic, which cranks up the comfort through barrel aging. 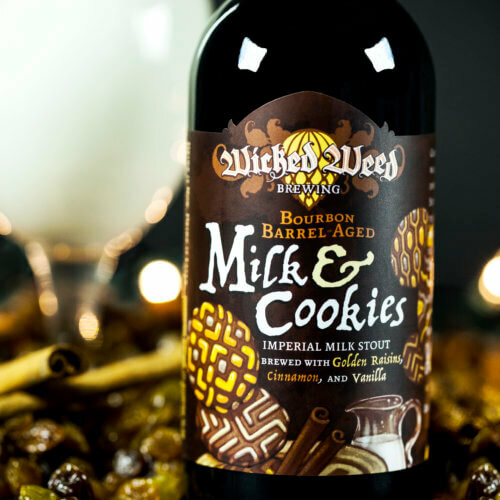 According to the Weed masters, they have, 'entrusted our Imperial Milk Stout with Golden raisins, cinnamon, and vanilla into the warming embrace of Kentucky Bourbon barrels to carry us home for the holidays'. Hell, its early December but feels like the holidays so I should enjoy this with earnest. Pegged as Hoppy, Bitter, Fruity, Malty, Tart, and Funky on the website, I would have to say malty is the only feeling of these descriptions that resonated through me after consumption. It's a stout so I'm not sure of the hoppy. Bitter, maybe. I've had more sugary versions but this one is more down the middle. Fruity? Not unless Bourbon is a fruit. I have had quite a few different varieties of bourbon barrel stouts lately and would have to say that this is in the top 5. Minor notes of vanilla but no raisins (I may have to form a movement, tho). Funky? Yes, I am. Absolutely. Loved the creamy and soft liquor hint and found it a great starter kit on a 28 degree day. This seasonal is a smoking 9.5% ABV so make sure it comes with a pre-programmed number for a ride home if you get into 'em. Baby's diaper? Maybe. Not my favorite of the day but it's still early. The saving grace was the 5.1% ABV, which allowed me to walk to the chachtzky room under my own power.